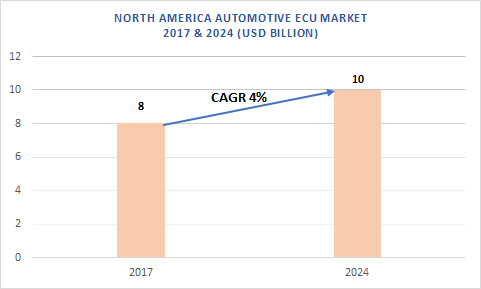 North America automotive ECU market is driven by the increasing trend of vehicle electrification owing to initiatives such as low fuel & energy consumptions in modern vehicles. Increasing environmental pollution and a high non-renewable resource consumption in the North American countries is accelerating the utilization of EVs and HEVs. As a result, the demand for control units is growing and an increasing implementation is witnessed in alternate powertrain & engine management systems required in such vehicles. Furthermore, government policies that support the overall development of the automobile industry are also contributing to the high demand for control units, further accelerating the North America automotive ECU market expansion. In the North America automotive ECU market, passenger vehicles are experiencing popularity owing to a high consumption in the U.S. and innovations in infotainment & ADAS solutions. These vehicles are adopting several architectural and functional innovations that provide advanced luxury and comfort to customers. Additionally, passenger car manufacturers in the U.S. are focused on offering these features in the new models to offer a high value and enhance the customer experience. Improving consumer lifestyle and developments in all industry verticals is also contributing to the growth of the North America automotive ECU market. ADAS & safety applications are gaining high traction in the North America automotive ECU market due to the increasing implementation of driving assisted systems such as airbags, braking systems, etc. in modern vehicles. Moreover, the increasing need for safe & secure vehicles to reduce road accidents across the U.S. and Canada enforces automakers to implement such systems in newly developed cars. Companies such as Bosch Group, ZF, and Continental AG, among others, provide specific control units that have implementations in the ADAS and self-driving electronic systems. These applications provide increased safety to drivers and alerts to the passenger prior to possible vehicle accidents. Prominent companies in the North America automotive ECU market are Continental AG, Atmel Corporation, Delphi Automotive, Bosch Group, Denso Corporation, Lear Corporation, Hyundai Mobis, Lear Corporation, ZF Friedrichshafen, Hitachi Automotive Systems, etc. These companies adopt various product development and innovation strategies, to strengthen their product portfolio and address the demand form leading OEMs across the globe.